The Victorian period lasted from about 1834 to 1902, the period of time when Queen Victoria was ruling. This was a time when ideas were shifting about; it is sometimes referred to as “romantic”. During this time, Charles Darwin published Origins of the Species, social reforms were made and several wars were fought. 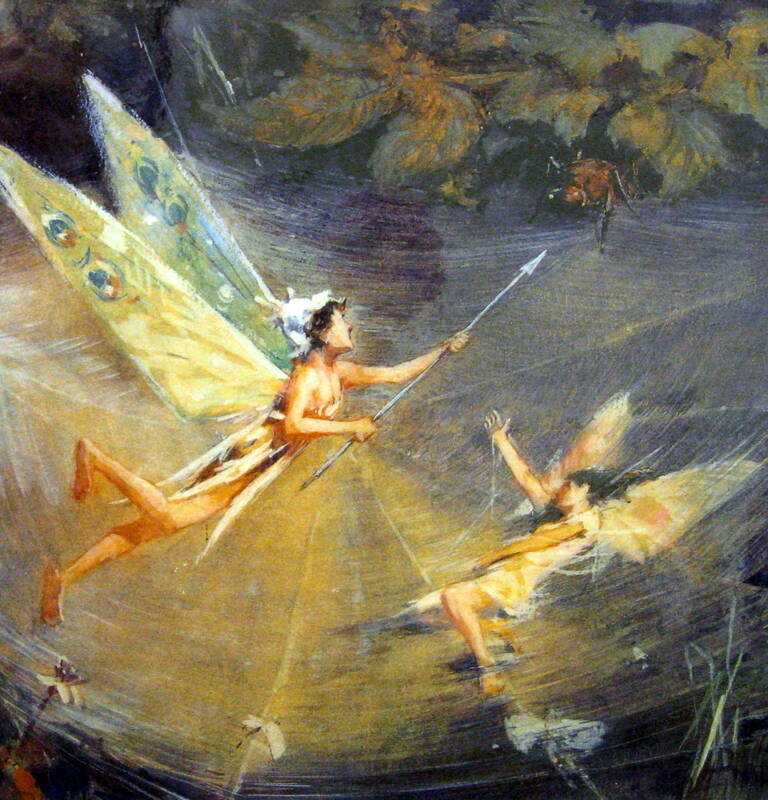 Fairies became a popular theme in art, perhaps because they symbolized innocence, playful freedom and magic. English artists have created all the Victorian era fairy artwork in this packet. The fairy fashions came from a 2005 calendar promoting the book Fairie-ality. More fashions can be seen at their website http://www.fairie-ality.com. 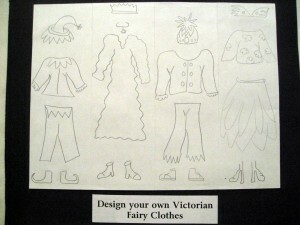 If you wish to show more fairy fashions on the classroom screen from this website, discuss with teacher beforehand so there is time to prepare. Projecting areas of The Dance of the Little People and Midsummer Eve on the larger screen is recommended; it will be hard or impossible to see details of these by simply holding the pictures. Dialogue could begin as you hold the picture, then move to the screen for further discussion. 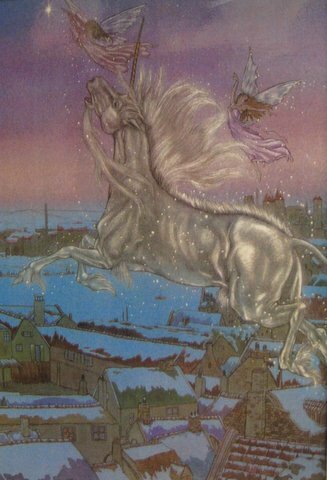 This picture is from the children’s Princess Mary’s Gift Book and accompanies a poem, A Spell for a Fairy, by Alfred Noyes. 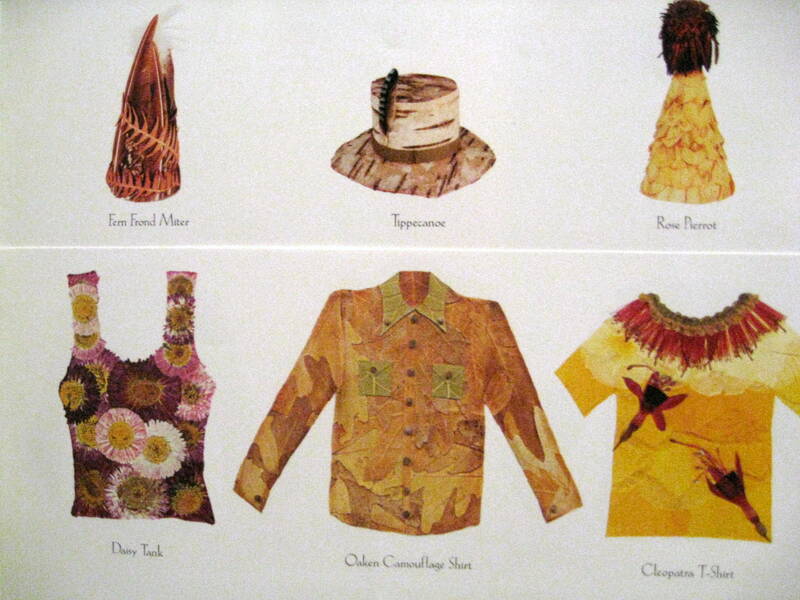 It is a printed color plate book illustration. 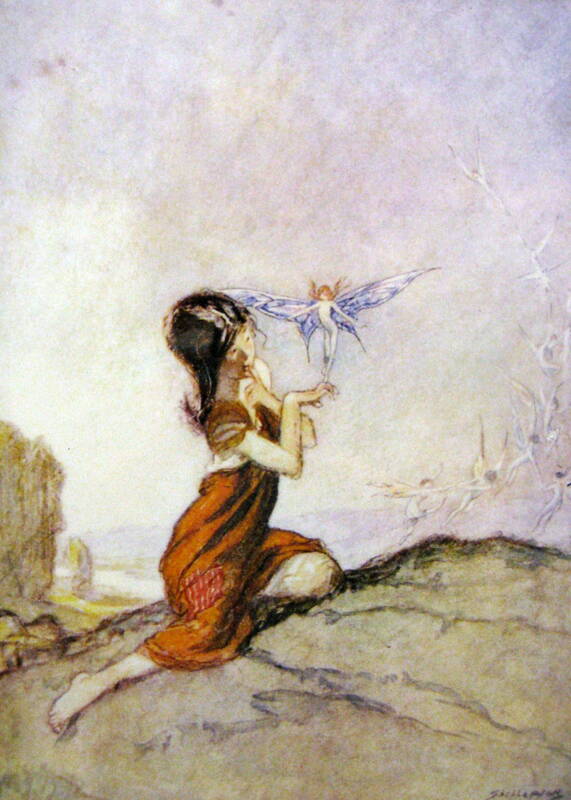 The poem describes a procedure to make fairies visible to humans. This is one of the pictures involved in the “Cottingley Fairies”, an incident involving Elsie Wright and Frances Griffiths, two young cousins living in England in 1917. The girls claimed to have photographed real fairies in their garden, located in Cottingley. The pictures they took (five photos in all) showed the girls with small, winged creatures. Many people believed the pictures were real, including Sir Arthur Conan Doyle (who created Sherlock Holmes), who wrote and published a book on the Cottingley girls in 1921, titled The Coming of Fairies. In the book, the well-known author also expressed his own belief that the photographs were genuine. Doyle’s father and uncle had been renowned fairy painters and believers in fairies. Sir Arthur Conan Doyle supported both in their belief of fairies and the supernatural. In 1977, however, a man named Fred Gettings, who was studying book illustrations, noticed the book this painting is from. 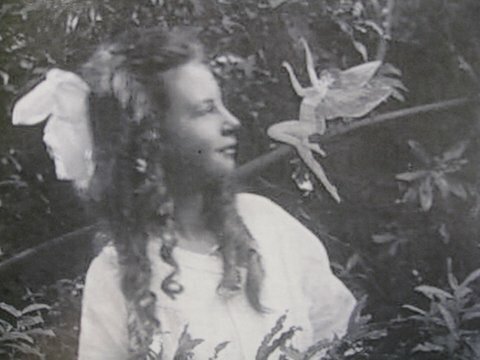 The fairies pictured were very similar to the Cottingley fairies and it was speculated that the girls could have cut the pictures out and photographed them. 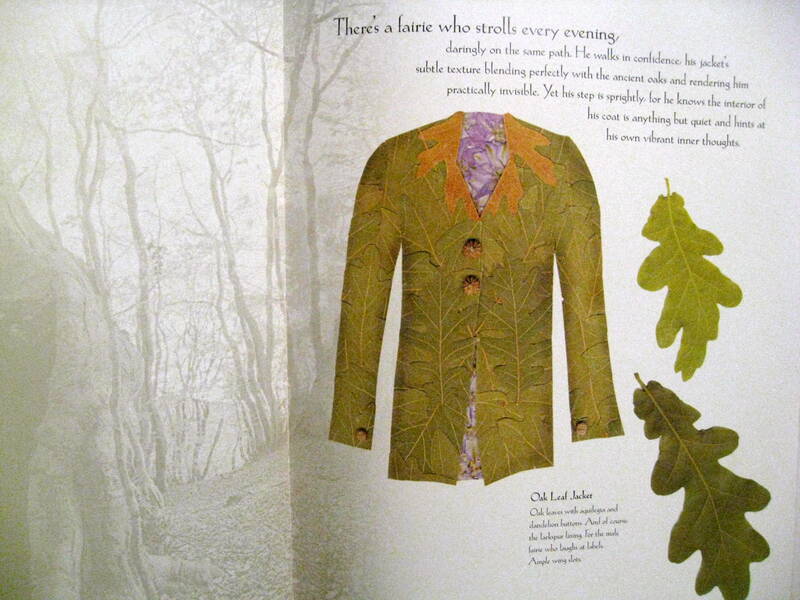 It is highly probable that the girls had a copy of this book to use as templates for their own garden fairies. Yet, many people were still strong believers of the girl’s mysterious story. 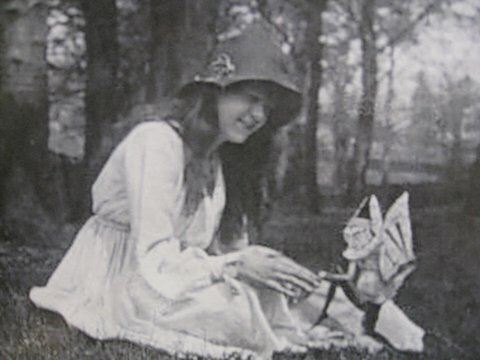 Around 1981, the Cottingley fairies were finally admitted to being paper cutouts, held in place with hatpins, at least by Elsie. 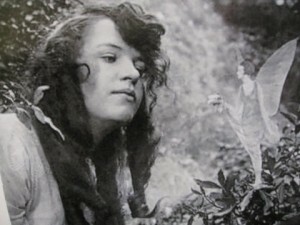 Frances continued to claim that the last photograph was of a real fairy, although she admitted the others, made by Elsie, were fake tracings of Claude A. Shepperson’s book illustrations. The Painting’s style is soft, EXPRESSIONISTIC, with indistinct lines, and mostly pale colors, with the exception of the girl’s ragged dress. Blue, gray and green are the dominant colors, though most of the colors merge and flow with one another. What is the FOCAL POINT (center of attention) of the picture and how do you know? Her dress is the brightest color used in the picture and she is the largest figure. What does this clue tell the viewer about her? Why are the other fairies so small when compared to the fairy on the girl’s fingers? By making them smaller, the artist has made them appear farther away. Why might Elsie and Frances have told people their photographs were real? This is open to opinions and discussion. Avoid specific conclusions as to the authenticity of fairies. Each child should be allowed to wonder over the “magical” things they think about during childhood. This is not a chance for you to voice your own “facts” or feelings to the children. Leave them wondering. Do not take away their own chance to discover, or discuss with their own parents, the ins and outs of childhood fantasy. A phrase such as “I think the idea of fairies is so much fun!” is a good way to avoid stating a personal view. 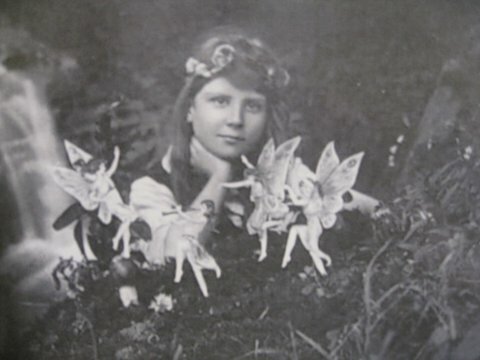 Make your own Cottingley fairies (only don’t use them like Frances and Elsie did!). Draw fairies on paper and cut them out. Then take a close up photo of kids with their fairies (if they don’t want their picture taken, that’s O.K.) to take home and tell the interesting story to their family! You can use strings to hang the fairies around like they are flying, or, if you can find a suitable material, pin them so they look like they’re on the ground. Safety pins would work well if you do pinning. William Holmes Sullivan was a British painter who lived and worked in Liverpool, England. He was a pre-Raphaelite artist who also painted a picture called, Battle of Waterloo. Not much is known about his life, not even his exact birth date; three possible birth years are 1870, 1836 and 1862. His painting The Bewitched Piper is very similar to the painting shown here, although much blurrier and less focused. Mr. Sullivan died in 1908. The painting has a fairly balanced amount of warm and cool colors; the two most prominent colors seem to be yellow (or gold) and blue. The painting has a very realistic look to it, despite the fact that it shows a fantastical subject. This painting was probably painted with oil paint because of all the delicate small detail it shows. What is happening in the picture? Depicts a man playing a bagpipe while a group of fairies dance around him. Where the fairies are dancing is a ring of light, a “fairy ring”. From all around more fairies are approaching to join in the dancing. Two tired fairies are relaxing in the far right FOREGROUND. To the right of the painting, behind a tree, what do you see that has an unusual pinkish glow? Another group of “little people.” One has its hand on its hip and leans against the base of the tree to observe what is happening below. What is the yellow glow of light, in the far background, across the very top of the picture? The moon, or maybe the sun, is rising along the distant HORIZON LINE. What is happening in the BACKGROUND, to the left, where we can see small dots or “points” of white? 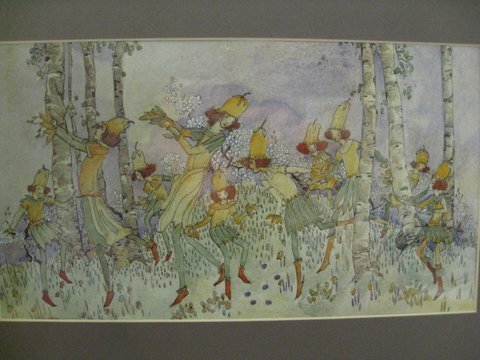 A line of fairies is winding down the trail, towards the man and the other dancing fairies. The white dots are fairy lanterns. Is this just a fairy party? According to the “fairy ring” legend, the fairies are probably getting ready to magically cause the man to fall asleep so they can take him back with them to their secret fairyland. If you notice in the picture here, as well as in the Midsummer Eve painting, the two humans in the scenes each carry musical instruments. 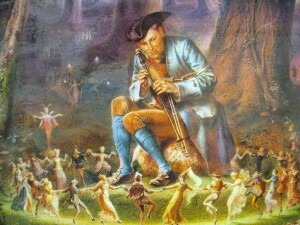 Because it is said that fairies love dancing, they might like having a musician visit their magical kingdom for awhile. Can anyone describe the man’s shoes for me? What type of clothes are the fairies wearing? Most wear medieval court clothes, the type worn in castles of fairy tales. 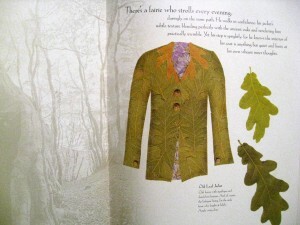 Can you see any fairies dressed in the same fashion as the man? There is only one, in front of the man, just to our left. The painting was created sometime in the later 1800’s. The clothing the man wears dates from the 1700’s, similar to the style worn at the time of George Washington. Apparently, the artist created a picture of an event that was supposed to have happened long before the time that the picture was painted. 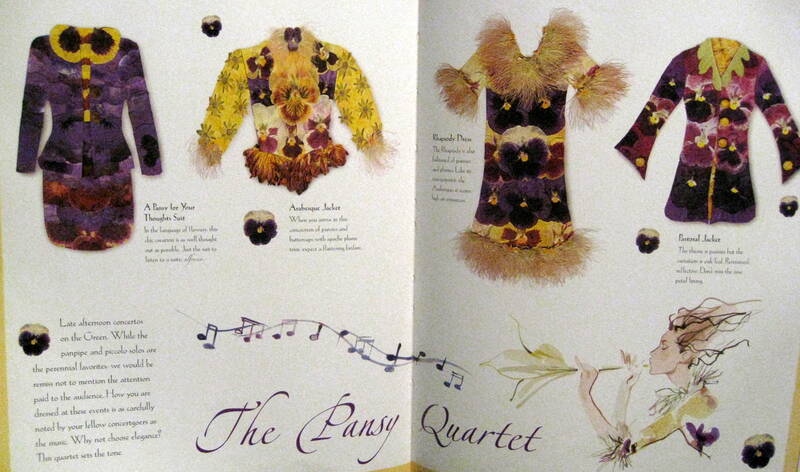 Almost all of the fairy clothing dates from before the 1400’s. Nearly everyone observing this painting might miss the small detail of a single fairy dressed as the man, especially if they know nothing about historic clothing styles. That one fairy is dressed in this more “modern” style of clothing, in fashion a few hundred years later, is highly unusual. Do you think this was because only one fairy paid attention to the latest fashions of the human world and wanted to be a “fashion leader”? This is an unusually significant detail of the painting. It gives a mysterious “clue” to what might be really going on in the picture’s story. Does anyone have any ideas what this mysterious “clue” might mean? There are no wrong or right answers. It is a mysterious detail that should cause kids to think and analyze the picture closer (a higher level thinking skill exercise). Do you think there is more to the story of what is happening in this painting? What do you think may have happened before the scene of this painting? 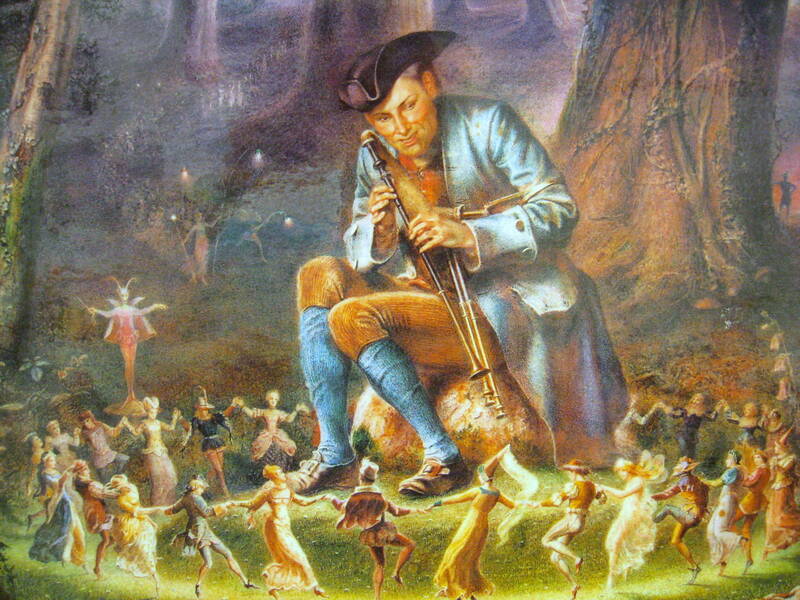 How do you think the man came to be playing music in a forest, surrounded by magical “little people”? Do you think the fashion conscious fairy had anything to do with it? Pick three vague titles (for example, “fairy spring”, which could mean anything from a bedspring to the season) and let the children choose one. They will then paint or draw their interpretation of what the title is saying. All interpretations are considered correct; the main idea in this project is simply using imagination. Additional titles might include “fairy meeting”, which could be a surprise encounter with a child, adult, dog or forest creature, to a fairy family reunion, or a formal fairy business meeting. “Fairy sprinkle” might be a fairy playing in the rain, or a fairy hiding in a garden being “watered” by a gardener. “Sprinkle” might also refer to fairy dust. “Fairy surprise” could refer to the surprise of a fairy, or fairies, also to someone “discovering” fairies. “Fairy breeze” could be wind blowing fairy hats off and bending tree limbs, to a group of fairies causing a breeze flying fast. “Fairy Fall” might be either a comical fairy spill or a season. Give kids only one explanation of the two possibilities for a title, then their three title choices. 3. 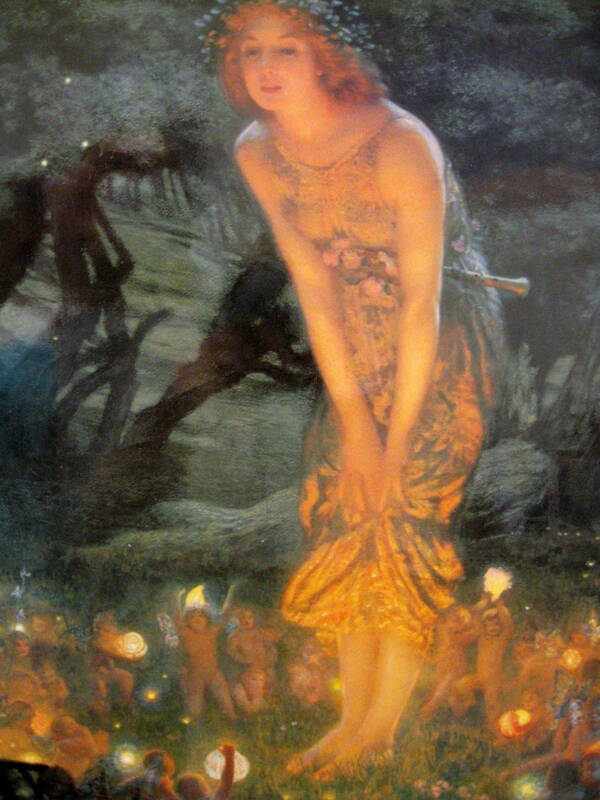 “Midsummer Eve” by Edward Robert Hughes. Watercolor & gouache on paper (1908). Edward Robert Hughes was born on November 5th, 1849, in Clerenwell, London, England. He was the only child of a Welsh family. From early on, he had an artistic influence in his uncle, Arthur Hughes, also a famous artist. Due to his uncle’s encouragement, Edward went to the Royal Academy Schools to learn about art. Hughes is considered a symbolist painter, meaning he uses objects to represent something else, usually a thought, or an idea, which are abstract and cannot actually be seen. He often used blues and gold in his work, as well as an apparent glow, which he may have discovered from artist William Holman Hunt, whose famous painting, “The Light of the World,” Hughes finished on account of Hunt’s fading sight. The artist tried to marry the daughter of poet George MacDonald, but she died before their wedding. Later he married Emily Eliza Davies. One of the things Edward Hughes was known for was being kind (and probably helpful) to young painters. He was also Vice President of the Royal Watercolors Society from 1901 to 1903. The next year, on April 23rd, 1904, he died of an unsuccessful operation. Of his many paintings, (many of them portraits); some interesting titles are “Lady Shalott” and “Night and her Train of Stars”. Besides being the subject of one of Edward Hughes’ paintings, “The Lady of Shalott” is also a famous poem, written by Sir Alfred Lord Tennyson. The Lady of Shalott may be written about a fairy; since in it, a person “whispers, ‘Tis the fairy/ Lady of Shalott.’” It is likely Hughes based his painting titled “Lady Shalott” on Tennyson’s poem. This is an example of realistic painting applied to a fantastical subject. The name of the painting is “Midsummer Eve,” a time people considered magical, a time when the world of humans and that of fairies were at one of their closest points (the other being Halloween). The picture has many Pre-Raphaelite features, such as a soft glow around the subjects and a medieval look to the young woman. The Pre-Raphaelite Style is also known for great attention to detail and “idealization”, which means painting the subject “more beautiful than real life”. Do you think Edward Hughes paid great attention to detail, like other painters of the Pre-Raphaelite Style? Does the young woman in this painting seem “idealized” (more perfect than real life)? The painting was created in 1908, during the Victorian times, when fairies were a very popular art theme. Fairies are often associated with innocence, and these fairies have apparently been modeled on babies, perhaps to emphasize this meaning. What is happening in the picture? A beautiful young woman is standing in a forest glade in the center of a group of tiny winged creatures carrying mysterious magical lights. The lights illuminate the girl as she bends down to look closer. 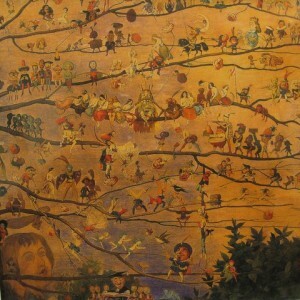 The painting illustrates what is known as a “fairy ring”, brought up in many traditional tales about fairies. Legends say that when fairies circle a human this way, and magically lull them to sleep, the human is taken away to fairyland. It is told that when the humans return from what they thought was a one or two night visit in fairyland, they are surprised to discover that years and years have passed in the human world they left. How might that painting have influenced the painting you see here? The artist may have learned how to create the apparent glow seen in the picture from the artist whose work he finished painting when William Hunt’s eyesight began to fail. What is a “symbolist painter”? An artist who uses objects or subjects to represent something else, like a thought or an idea. Make an illustration for a poem. Provide at least two poems for kids to choose from. Use clay to sculpt tiny fairy figures. Refer to Rotation #2 Packet 15. Bessie Pease Gutmann packet for project information on using soft chewing gum (not chewed) to create tiny fairy babies. Walter Jenks Morgan was born in 1847 in Bliston, England. He went to Sir Robert Peel’s school, apprenticed with Thomas Underwood, attended the Birmingham School of Art and won a scholarship at the Birmingham Society of Art, so it appears he really knew what he wanted to do in life. He illustrated both books and magazines, while also creating paintings. He never married, and lived until 1924. Narrative paintings often have a sense of action to them. This type of painting depicts a story or a happening. This is different from portraits and still-life paintings, since the subjects of these styles are not likely to be moving. One noticeable absence of detail in this picture is the fairy faces, or the lack thereof. All that can be seen is the facial outline and the play of light on the shapes. Most of the details appear blurry, at least at first glance. When you look closer, however, you can see individual strands of hair and spider-silk, realistic muscles, and other small things. This painting was probably done in oil paint on canvas, judging from the clear, well-defined brush strokes. This is a “narrative” painting. What is do you think “narrative” means? A story or a happening. Narrative pictures are usually filled with action, excitement, suspense and MOVEMENT. What do you notice about the fairy faces? What else might be said about the STYLE of this painting? It is an example of Expressionism because the artist was more interested in creating a MOOD than in making the picture true to life. What is one of the most common COLORS in this picture? Off-white or light tan. Here we have a line drawing of Here I Am to Rescue You that you can have the children make captions for. Tell them to draw the faces and put what one or more of the subjects are thinking or saying. 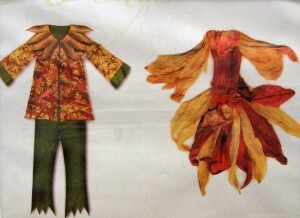 Draw and cut out several tissue paper fairies. Tape a piece of thread to each fairy’s back and tie fairies to each end of a twig or craft stick. Hang twig, from the center, with a piece of clear fishing line and watch these lightweight fairies flutter whenever some one walks by. Collect all kinds of natural things to build furniture for a fairy house. 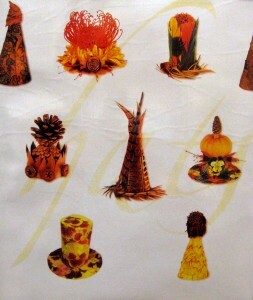 Make a tabletop by gluing or weaving twine or raffia around small pieces of twigs. Use twigs to glue or lash a fairy chair. See what kinds of creative inspiration natural seedpods, pine cones, driftwood, bark, or small stones can inspire for small fairy furniture creations. You could also use small boxes, thread spools, buttons, short lengths of cut doweling glued together to create a tiny fairy chair, table, bed, or a couch. Paint your creation after the glue dries. Build a tiny fairy house from small pieces of wood or poster board. Volunteers will need to cut pieces to size ahead of time to have enough time for the kids to build. Experiment yourself and build a sample or two for kids to see as they work. 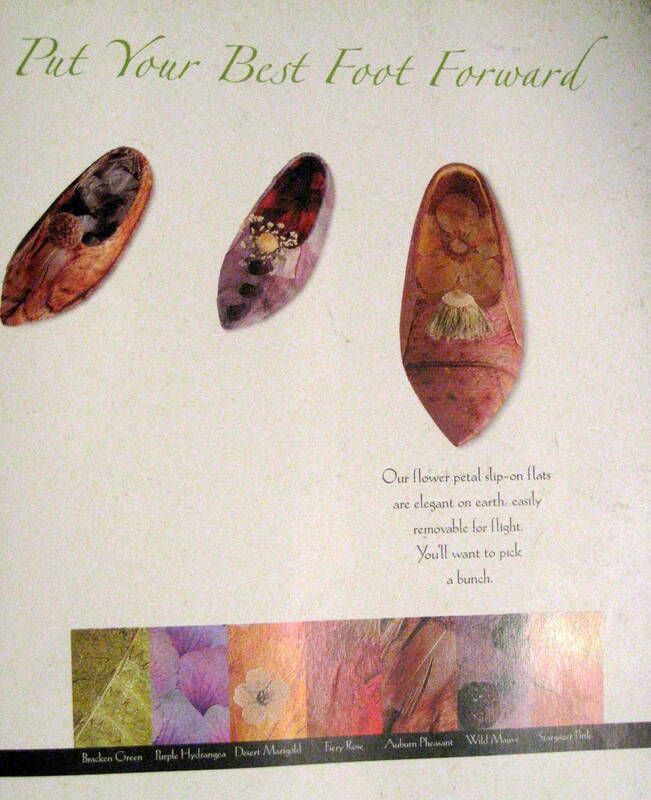 Build a Thumbelina (also a famous fairy) bed from half a walnut shell. Use a small cotton ball, beneath a small piece of flower patterned fabric, to make a fluffy comforter. Stitch or glue a small pillow cut from felt and fluffed with a tiny piece of cotton. Glue a thin ribbon under and around the bottom of your Thumbelina bed. Make the ribbon long enough to tie in a bow several inches above the bed, to work as a hanger for displaying the tiny bed. Use half of a walnut shell to build a fairy sailboat. Put a small piece of clay in the bottom of the walnut shell to anchor a toothpick mast. Create a sail by cutting a small triangular piece of paper 1 ½” – 2” tall. Decorate your sail with a little glitter, or “fairy dust”. A sail could also be created using a single silk flower petal. 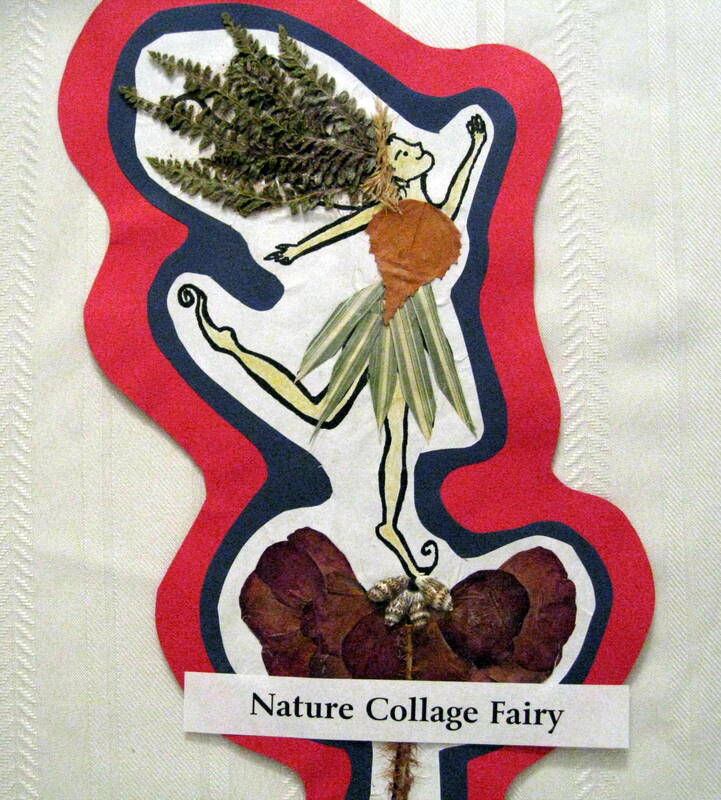 Color and cut out a set of fairy wings from the handout (print on cardstock). Sculpt a three-dimensional fairy from a small piece of clay to attach to the colored wings. 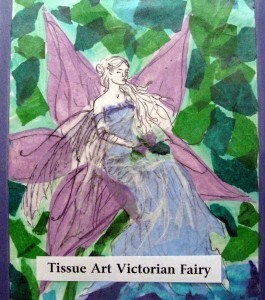 A nice addition would be to glue thin strips (½” x 8”) of colorful netting under the wings, to stream in the breeze behind the fairy. 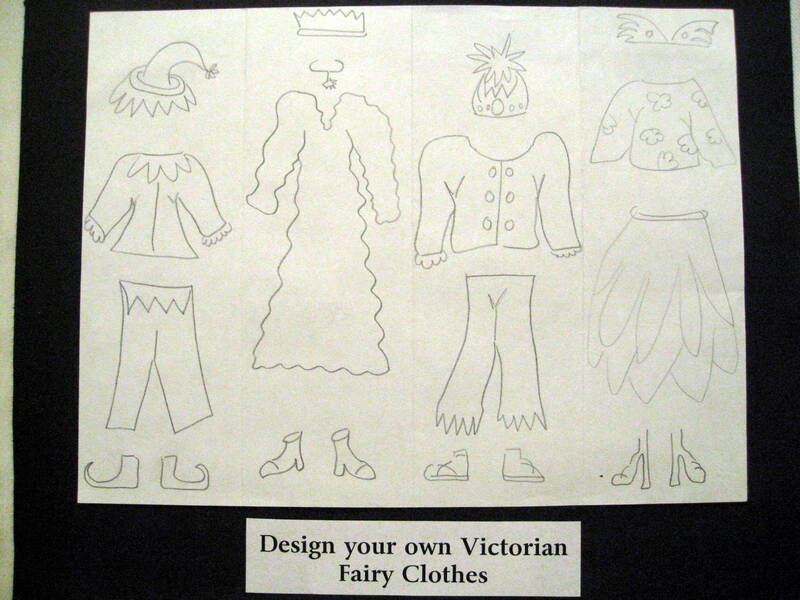 Fairy drawings will also work. 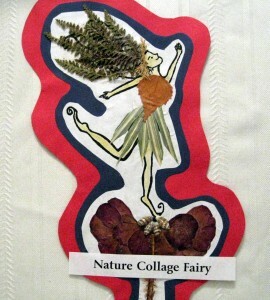 Younger kids (K-1) will enjoy decorating their own set of fairy wings to wear. Use a piece of poster board or cardboard and cut these out ahead. A good wing size is about 16”-18” high by 10”-12” wide. Use a large piece of folded butcher paper to create a pattern. 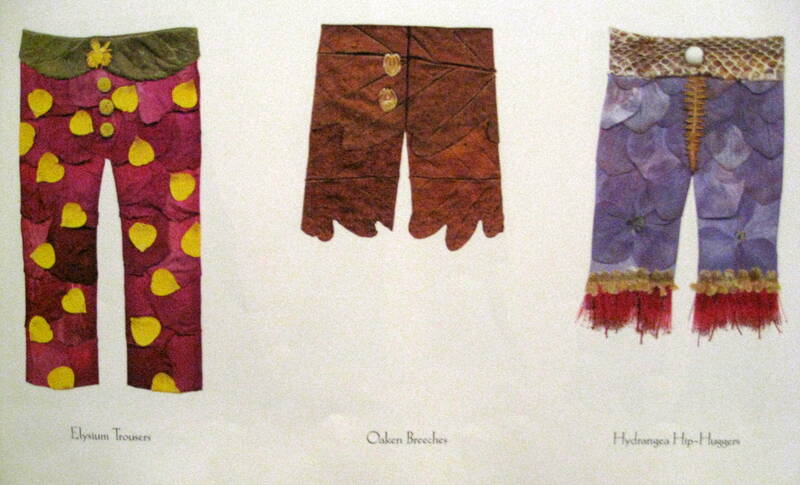 Fold poster board or cardboard in half and trace pattern. Make two small holes above and below where shoulders will be on each side of the wing. Thread two strips of ribbon or twine through the holes, and tie these together (like a backpack). Allow plenty of room for arms and shoulders to fit comfortably through the ribbons. Paint symmetrical (same arrangement on each side) geometric shapes on each wing. 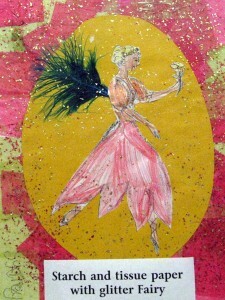 Sprinkle with glitter “fairy dust”. John Anster Christian Fitzgerald (1819 – 1906) was a Victorian era fairy painter and portrait artist. He was nicknamed “Fairy Fitzgerald” for his preferred subject of his art works. Many of his scenes are dark and have elements of danger in them. Fitzgerald developed his artistic talents on his own, as he appears to have been largely self-taught. His work was first shown at the Royal Academy of Arts in London in 1845. He also exhibited his works at the Society of British Artists and the Royal Watercolor Society. In the late 1850s he created a series of Christmas fairies for The Illustrated London News. The artist imagines a scene where a group of warlike fairies are battling a bat that seems larger than all of them put together! Are they brave or are they defending themselves? 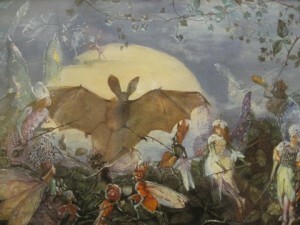 The title indicates that the fairies are attacking the poor bat and the bat looks very surprised! The bat and many of the fairies and painted in a very realistic fashion, yet some other fairies look very ghost of spirit-like and almost transparent. There are also some very strange bugs or small creatures or perhaps fairies made of small leaves in the center foreground. Why are these fairies attacking the bat? That is hard to say – there is no right answer here but the fairies surely look like they will just be watching the bat fly away very soon. It looks more like they are confusing the bat than really meaning to hurt it. Did the artist paint these fairies in a realistic way? Yes, the bodies, hands, gestures and movements look very realistic. Paint a scene in which tiny fairies confront a much larger creature. The tiny fairies could also just be guarding a flower or a small castle against imaginary – or very real giant bat or mouse or cat invaders! This is a great project for boys, who might not be excited about fairy fashions, but quite interested in cool fairy armor or spears. Arthur Rackham was an English artist who is now more widely known as a book illustrator. He was a fragile child who struggled with his health in London. Rackham was helped by his aunts who took him traveling to Australia. Arthur Rackham is widely regarded as one of the leading illustrators from the ‘Golden Age’ of British book illustration. This age encompassed the years from 1900 until the start of the First World War. Rackham invented his own unique technique for his art; he would first sketch an outline of his drawing, then lightly block in shapes and details. Afterwards he would add lines in pen and India ink, removing the pencil lines after the ink had dried. With pictures in color, he would then apply multiple washes of color until translucent tints were created. 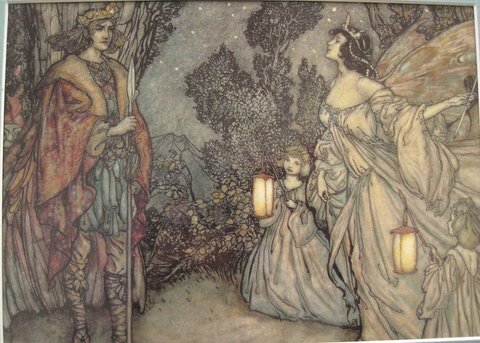 In this art work, Oberon, King of the fairies, greets Titania, Queen of the Fairies. This is a scene from Shakespeare’s play “A Midsummer Night’s Dream.” In the story, the King and Queen of the fairies are having a disagreement: can you tell from the art work whom the artist thinks is the one on the winning side of the argument? 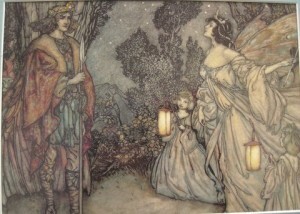 Oberon is portrayed as dark, warlike and commanding, with a rather eerie face of his companion peering from behind his cloak, while Titania is beautiful, gentle and yet strong, with her companions dressed in white and portrayed as lovely children with glowing lanterns to bring light to the dark forest. Does Oberon look happy to see Titania? No – he looks very serious. Titania looks very defiant – her head is held high and she looks very much like a queen and not to be intimidated by anyone. Jessie Marrion King was a Scottish artist mostly known for her book illustrations. Her father was a minister and she was discouraged from being an artist by her parents. She began her studies to be an art teacher and then she won awards and illustrated books and became well known for her own art. After she married, she moved to Paris and her works are considered to have been influential in the creation of the Art Deco movement. 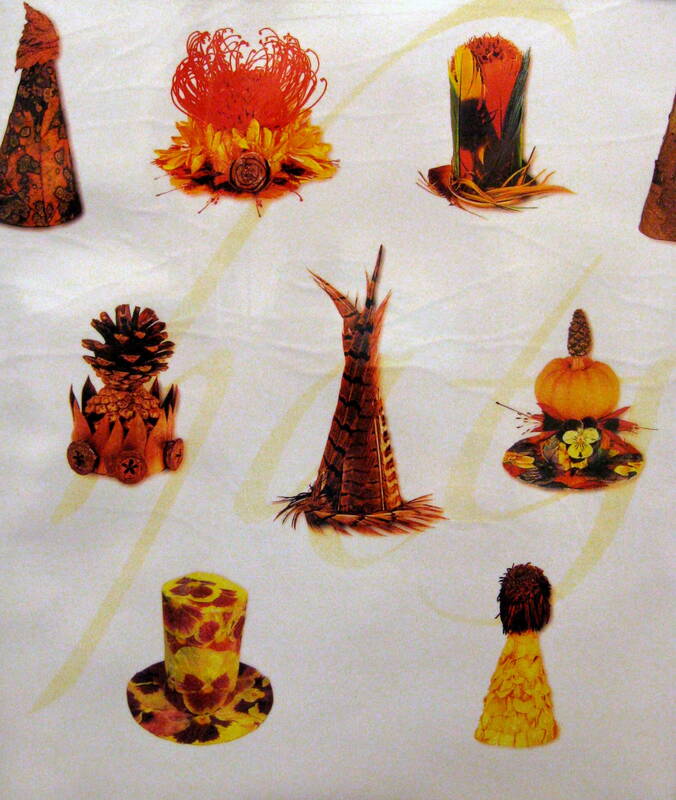 The style of this art work is flowing and pleasant and mostly decorative. The work does not have a great amount of depth and perspective as the background is just mostly a flat blue sky. The trees do overlap the dancing fairies but otherwise there is not much attempt at depth. The movement of the work draws us in and overall the scene is happy and pleasant – like an illustration in a children’s book. 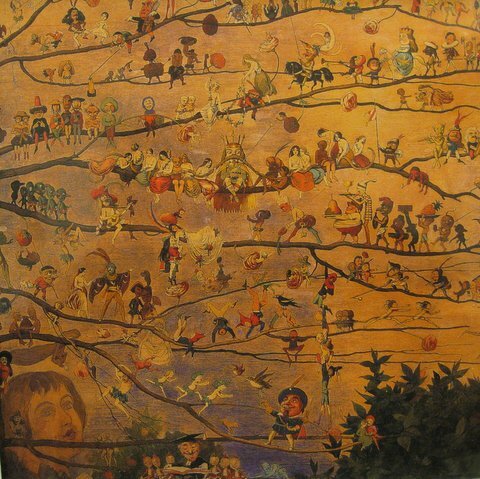 Do you think the artist painted this picture as a portrait of each individual fairy? Not really: their faces all look very similar! What do you think the artist wanted you to see in this art work – where is the point in the art work with the most contrast? (Most art works have a focal point – where the greatest point of light meets with the darkest part, usually). This painting has very regular and uniform color and contrast. Movement and rhythm seem to be more important than color here. 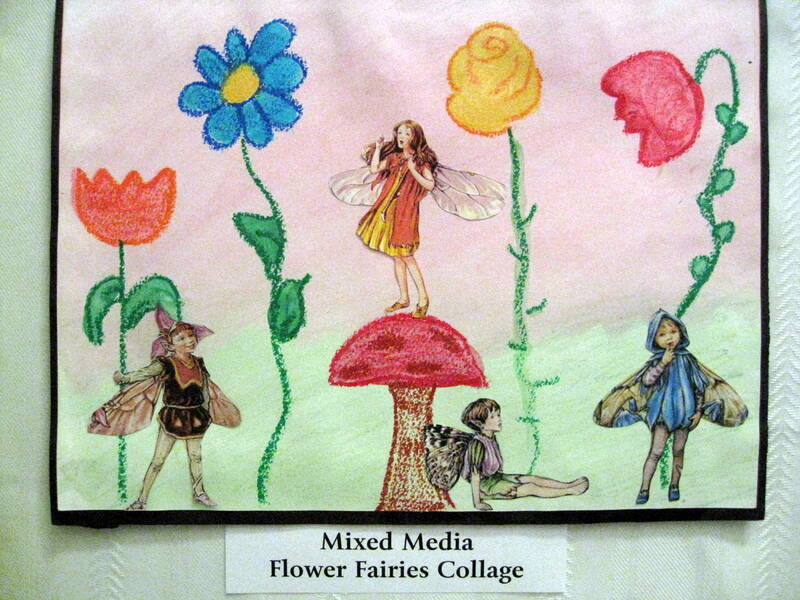 The eyes might go more towards the tallest fairy in the middle as her face is in the very center of the composition. Place beautiful fairy pictures all around for inspiration. What if a fairy popped up out of the flower? Would she/he be watching you or just waking up? What are you doing as you happen to see the fairy? Now separate the sentences and add imagination. Make the entire setting come alive. The fairy is yawning, but what about the flowers just opening up for the day? They seem to be yawning, too, don’t they? What type of mood is the fairy feeling? Curious, embarrassed, friendly, angry, noisy, quiet, shy, chatty? Use analogies and compare yourself to the fairies. 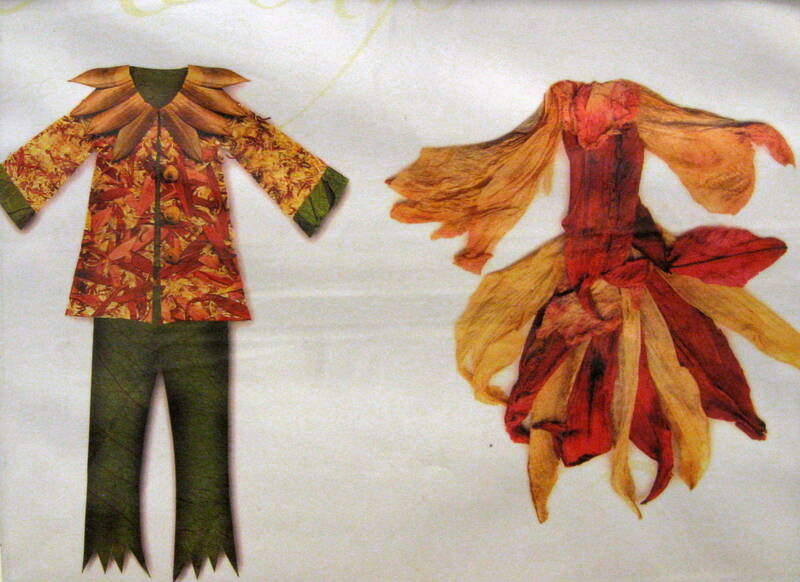 What would you wear, play, and eat if you were a fairy? Would you have any pets? What type of pets? What type of work would you do? Where would you live (swamp, meadow, forest, attic, tree trunk)? What would your house be made of? How would you build your fairy house (tools, equipment, building materials, assistants)? How old might a fairy live to be? If fairies lived 100 years or more, how old might they be when they finally marry? Had their children? Grandchildren? What types of things might worry a fairy? Too little or too much rain? Finding enough to eat. Keeping warm and well protected over cold winter months. Being discovered by a mean or naughty person? Their misbehaving fairy children? The future for their children—safe and happy, or filled with unknown mystery and danger? Jot down ideas on a scrap paper as they come. These are just suggestions. Keep trying, don’t be too hard on yourself, and have fun. Your fairy poetry can be any length, it can rhyme or not, whatever you like. My little boys and girls. To pay for doing right. 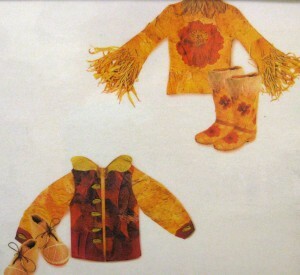 Plum puppets are waiting in blanket and quilt. In the moon’s gossamer, silver beams. You can’t find where she’s hid? And their fairy babies, too? The woods are full of faeries! I’ll tell; it’s easy, quite. Along this track of light. A woman of exceptional talent, Rose translated many rare children’s books from French and German to their first English editions. She was also the editor of one of the first children’s magazines, the Merry Go Round. Rose Fyleman is best known for her delightful fairy poems. She was born in Nottingham, England. Perhaps this magical setting led to her belief in fairies. Whatever the cause, we are blessed by many lovely fairy poems from this gifted author. And never be as rich. I have, I have! Isn’t it fun? Singing little fairy tunes to little fairy rhymes ? I have, I have, lots and lots of times! And dashing off behind the stars to tidy up their hair ? I have, I have; I’ve been there! Catkin: furry flower cluster, a long hanging furry cluster of tiny leaves and petal less flowers, produced by trees such as willows, birches, alders, and poplars. Handies: meaning “hands”—Victorian children used pens with inkwells to write in school, which was messy and often resulted in ink stains on hands and clothing.